Island Block & Masonry Supply is a premier manufacturer of concrete block and distributor of masonry & landscape materials. Our products range from basic components such as concrete block, sand, gravel, cement, and reinforcing steel to one of the largest collections of clay brick, interlocking concrete paving stones, manufactured stone veneer, natural stone veneer , travertine pavers, retaining wall block and tools to be found anywhere on Long Island. We carry the most recognized brands in the industry, as well as quality brands that are new to the market. Many of these products and materials can be viewed in racks or our in ground display. Originated in 1947, Island Block & Masonry Supply is a family owned and operated business dedicated to quality products and customer service. Originally called C&D Cement Block Company, the company pioneered the manufacturing of concrete block, initially making block by hand and then being one of the first to install an automated manufacturing facility on Long Island. To this day, we continue to manufacture all types of block and we run a wholesale distribution division supplying block to other mason yards. With our top notch delivery equipment, and 10 acres of inventory, we’ll be sure to help you find the perfect products and deliver them on time right where you need them. We service all of Long Island and the boroughs. Our sales staff provides knowledge and experience to get your project done right, even in the most complicated situations, while helping you select the perfect material to make your project stand out. 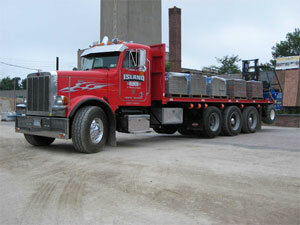 Island Block & Masonry Supply is an established supplier of construction, masonry and landscape material. We welcome contractors, builders, homeowners and architects. We offer our customers one-on-one attention, and stock only the highest quality products. We welcome all homeowners who need assistance designing their next project. We will work in conjunction with you and your contractor to come up with the exact look you want for your home. Our design professionals will work with you step by step to insure that your project turns out exactly as you have envisioned it. We offer products to support traditional designs in addition to the most modern trends. Island Block & Masonry Supply is located central to the Southern State Parkway, Sunrise Highway, and the Long Island Expressway on the corner of Straight Path and West Booker Avenue. We offer convenient hours during the week, and we are open on Saturdays. If you would like to meet with a design professional, we suggest you call to make an appointment. Island Block & Masonry Supply a family owned and Operated business, has been serving the New York area with quality concrete products for the residential and commercial market. Servicing Suffolk and Nassau counties, as well as Queens, Brooklyn, and Manhattan, Island Block has built and maintained successful relationships with contractors and masons.